There are numerous reasons you could find yourself face-to-face with this error. I’m not going in-depth to all of them but I will tell you why you are getting that error. The “The requested operation requires elevation” error indicates that you do not have the right privileges. This normally means the file has to be opened from an administrator account or the ownership of the file has to be changed/updated on your system. Running an file as administrator is really simple so I will not go into that (Right-click, run as Admin) neither will I tell you how to going into your Administrator account. Go to the properties of the folder that contains the files you need to change the ownership of (or just the file alone). Depending on how many files it are, this might take some time. Once it’s down you will be able to modify the Security permissions as you wish for the files and folders (such as Full Control, Read Only, Read & Write, etc). Right-click this shortcut and click Run as administrator or press the shortcut key Ctrl + Shift + Enter to start as administrator. 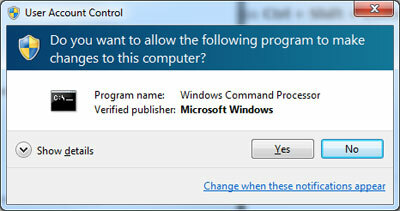 If done properly you should see a User Account Control window, like that shown below. Click Yes to open the Windows command line as administrator.